I first encountered Jane Irwin and her tiny but might creation, Vögelein, about two years ago. I was immediately impressed with Jane's passion for the project and comics in general, as well as her skills as an artist and storyteller. Since then, I've eagerly followed the slowly growing story of the titular character and her adventures in a very strange, but familiar, world with a burgeoning sense of respect for both creator and creation. 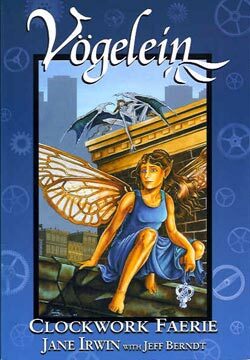 For those who might not typically give a fantasy title -- much less an independently produced one -- a second glance, all I have to say is that if you ignore Vögelein you're missing one of the most original, evocative and genuinely intelligent books that has graced the shelves of late. And, given both the rising quality and quantity of good and even great books appearing in the stores each and every week, that's no small praise. Bill Baker: For the uninitiated, who or what is Vögelein, and what kind of world does she live in? Jane Irwin: Vögelein is a clockwork faerie living in the modern world. She's been alive for over three hundred years, and remembers everything she sees or hears unless she winds down, at which point she starts to lose her memories, starting with the most recent, and moving quickly backwards. Since she needs to be wound up each day, she needs one or more people to keep her wound. Currently, she has several "guardians" in a major city that look after her. BB: Why place the series in a present-day world? Did it offer you a something that an historical setting would have, or were you trying to accomplish something by juxtaposing the ancient, the mythological, and the modern elements? JI: I really love modern fantasy, and there just isn't enough of it. I wanted to write a book in the same vein as Neil Gaiman, Charles de Lint, Emma Bull and Will Shetterly -- stories where the mundane and the fantastic coexist in everyday life. I like to believe in a world where incredible things can happen, if you only slow down long enough to notice them. That, and I think that the old gods and Faeries are still very much with us, but look very different from their earlier forms. I'm very much interested in telling stories of their evolution -- how they've changed as we changed. BB: Why don't we talk about the development of the series? How did the initial concept arise, what kind of process did it go through to arrive at its present form, and how long did it take? JI: The initial idea came when my friend Jeff Berndt and I were sitting around one night, brainstorming ideas for a comic that he would write and I would draw. We had just returned from a backpacking trip to Ireland and the UK, where we had met with so many coincidences and amazing people that all seemed far too incredible to have simply been chance. It felt like we had been guided from one spiritual experience to another, and we wanted to write a story that would capture that kind of thrilling, sweeping excitement, but still in the modern world. Our thoughts turned, of course, to the realm of Faerie -- and we asked each other what the exact opposite of a true faerie would be. The answer, of course, was a robot faerie, but that wasn't romantic enough. A clockwork faerie, on the other hand, was a perfect fit. So off we went. A year or so after that initial idea, Jeff had written most of the first issue and parts of the second and third, but got stuck enough that he decided to leave the project altogether. I modified the first issue to fit my own satisfaction, heavily edited his ideas for the second and third, and finished the five-issue script on my own, then finished painting it. The entire project took over six years from start to finish, but there were some gaps in between while I did other projects, and while I promoted and published the book both in single-issue and graphic novel format. BB: How much, and in what ways, did your creative partner contribute to the series? Also, how different would the book have been had he not been involved? JI: The book wouldn't have existed if it weren't for Jeff. Although he left the project fairly early, his stories and dialogue comprise the backbone of the first three issues. He was also the one that suggested that the Duskie and Vögelein meet. The Duskie predated Vögelein by six months or so; he got his start in an oil painting I did for a gallery show. Without Jeff's suggestions, Vögelein would have been a very different book, indeed. BB: How important was research to the shape and scope of the final product? JI: I did a whole lot of research for this book -- on watches, on the Tuatha de Dannan (Irish Faeries), on the late 1600's, on Heidelberg, and especially on Romani culture. When I started writing the complete script, Alexi had yet to be introduced, but I knew that I wanted a "Gypsy" character in the story. I had vague ideas about Roma history and culture, and had read a couple books by non-Roma, but all were in the covered-wagon-and-thievery mindset. I decided early on that I wanted to dig through all the stereotypes associated with the Roma and get to the real people, beginning with the word "Gypsy" and working through all the fortune-telling and such. When I really began to do research into books written by scholars -- as opposed to storytellers -- and Roma themselves, I learned more about a proud and mistreated people than I ever expected. Alexi's character changed dramatically -- he went from being a rake and a scoundrel to a talented trader just trying to get through life like the rest of us. I am pretty pleased with the results, and have had favorable reactions from some readers who are of Romani heritage. Another example comes with the final scene of the book (Spoiler Warning) where Vögelein and Alexi return to find Heidelberg in flames. I had originally planned for Vögelein to be wound for the first time in 1650 -- but I was having trouble finding a historical event that I could use to "kill Heinrich off" some twenty years later. Then, during a fit of research, I found that Heidelberg was sacked and burned by French troops in 1689. I slid Vögelein's first winding ahead to 1671, and used the destruction of the city to show Heinrich's final brave gift to Alexi and Vögelein: escape. BB: What was the creative process behind creating a typical issue of Vögelein? Did you work from a full script, a rough or detailed outline, or did you just kind of "wing it" and see what would happen? JI: I get paranoid if I don't know exactly where the story's going. I am in awe of those artists that are brave enough -- and such good storytellers -- that they can just start drawing at page one, plotting the book out as they draw, ending on page twenty-two with a complete story. I had a complete script written for the first five issues before I started work on issue two; I had completed the first issue using Jeff's script, but when he quit, I stopped drawing until I had a complete story to work from. Then I would pencil ten or twelve pages at a time. By the time I got to the twelfth page or so, the first would have been sitting for a few weeks and I would have a more objective view of it. I'd tweak the pencils for each page before I painted, and then I finally scanned them all into the computer and added gutters, word balloons and cleaned up small glitches. For the next book, however, I am going to try a new process that another artist showed me, where you use a small spiral bound sketchbook and, rather than write out a formal script, do a thumbnail of each page on one side, and put notes and dialogue on the other. It seems like a healthy compromise -- I get to work out all the plot an dialogue without having to sit down and type out a hundred-page script. BB: Was the series painted in black and white, or color with an eye towards black and white repro? And, if the latter, does that mean we might see a full color version of the book someday? JI: Oh, how I wish I had the money and time to do Vögelein in color! The book is painted in black and white acrylic -- in Payne's Grey and Titanium White for you artists out there. That way I only have to buy two pots of paint at a time, and I can crack out pages much faster than if I had to paint them all in full color. 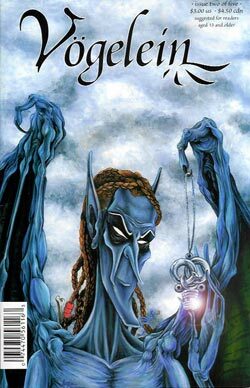 Someday, though, depending on finances and time -- I still work a day job -- I would love to do a full-color Vögelein one shot. I imagine it'd look a lot like Mark Smylie's Artesia in the final product, and not just because I'm a devoted Artesia fan ... Mark's and my loose painting style have some things in common, and I would have to paint looser to get the job done on deadline. The trade paperback's cover is done in a tight style; chapter five is closer to my loose style. BB: What's next? Are we going to see the further adventures of Vögelein and company, or are you heading for other pastures? JI: I am currently writing the next three or four Vögelein scripts, so unless something in my life changes drastically -- knock wood -- I should be starting on one of them fairly soon. Vögelein will be released in graphic novel format from now on -- individual issues were just too darn expensive. I don't have a clearly defined end for the series yet, but I hope to continue it for many more books. BB: What do you get -- personally and artistically -- from creating comics? JI: Some people de-stress by running, others by cooking, some by watching TV. I unwind by making art, and putting it into a format that other people can enjoy allows me to share my art with readers around the world. It's really gratifying to know that someone in Sweden or New Zealand is reading the stuff I would have banged out anyway, just to clear the cobwebs from my head. I also joke that I'm a frustrated children's book artist. For a long time I really wanted to get into book illustration -- but when I saw how harsh the playing field was, how draconian the rules could be, and how demoralizing the rejection letters were, I gave up. I'm not usually a quitter, but I could see that it was a seriously uphill battle from the start. When I made my first foray into the world of comics, I was overwhelmed at the reception I received -- people welcomed me with open arms, lauded my book, cheered me on. In the comics world, the doors that slammed shut in the more established field of book illustration were swung wide for me to waltz through at my own pace and under my own terms. The freedom of self-publishing is intoxicating at times, and it's a huge reward for all the hard work and long hours -- having complete control over one's characters and stories is a very rare thing these days, and I treasure that ownership more than anything else. BB: What do you hope readers get from Vögelein? JI: When I set out to write Vögelein, I wanted to create a comic for people who don't read comics. I wanted to make a book that could bridge the gap between comic store and book store. And most of all, I wanted to create a book that I would enjoy reading -- a book for smarter, older readers who appreciate good plot, strong women without gigantic breasts or guns, well-rounded characters, and a good slice of fantasy in their reality, not the other way round. I hope that people find at least a couple of those things to be true when they read Vögelein. BB: What's the one question you've never been asked, but have been dying to answer? JI: One little idiosyncrasy I've wanted to divulge for a while goes along with the question "What city is Vögelein supposed to be set in?" In my mind, it's always been the city from Hill Street Blues -- God, I love that show -- an anonymous northern city somewhere in the rust belt, with pockets of funky vibrancy, but full of bad neighborhoods and rundown buildings. Expect Andy Renko or Mick Belker to pop up in a background scene someday. The trade edition collecting issues #s 1 to 5 of Jane Irwin's Vögelein will be in stores on 10-1-03. It's also currently available through her online store, which can be reached through her website at: http://www.vogelein.com.